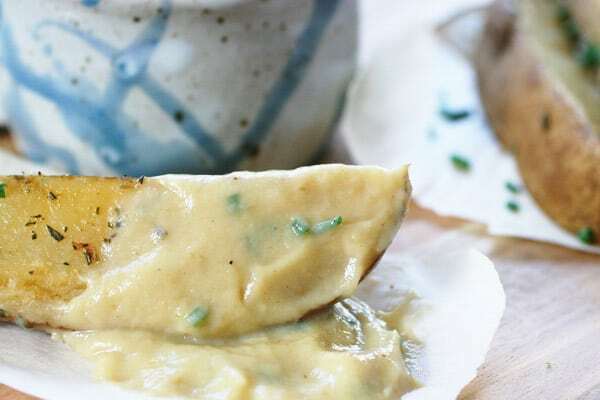 Last week Susan Voisin over at Fat Free Vegan Kitchen posted a recipe for Fat-Free Onion Cream from something she caught over at Food52 by ChefSteps. It’s basically roasted onions pureed into a cream with a bit of lemon and salt in it. Susan mentioned it would make a great base for all manners of things and I couldn’t agree more! My brain started thinking about what I could try. I mentioned on Instagram the other day that my wife and I are reducing the amount of oil that we eat. I don’t mean that we restrict all fat- we still consume avocados, olives, and nuts, just in smaller amounts than we had previously. While there are/were a lot of reasons that we made this decision, it largely has to do with this article, Why I’ve Finally Stopped Eating Oil, on No Meat Athlete. Cooking without oil is not something that I am familiar with. People often say that they had to re-teach themselves how to prepare meals once they moved to a vegan diet- I feel the same way about using oil. Instead of using a bit of olive oil in the skillet to sauté my vegetables, I’m using water. I’m roasting in rich vegetable broths and things seem to be okay. I’m not saying I’ll never roast carrots in a bit of oil again, but for the most part I won’t. I’m using more spices than I had previously and I’m getting more creative in the recipes that I’m concocting. I like the challenge. After thinking about it for day or so, I decided to use the onion cream to make a sour cream and chive dip. I needed something to use as the base. I didn’t want to use cashews because I was looking for something that was lower in fat. I could have used silken tofu, but I had done that recently with my Vegan Cilantro Lime Crema, I wanted to try something new. White beans might have worked too, but could have been too gritty- even if I used a high-speed blender. What I came up with was cauliflower. Yup, cauliflower. Roasting and pureeing cauliflower makes a rich and thick cream that is really quite unbelievable in it’s silkiness. It makes a great neutral base for sauces. I took the cauliflower cream and blended it with a batch of the onion cream until dreamy. Then I blended in some lemon juice and a bit of salt. Add some fresh chives and viola! 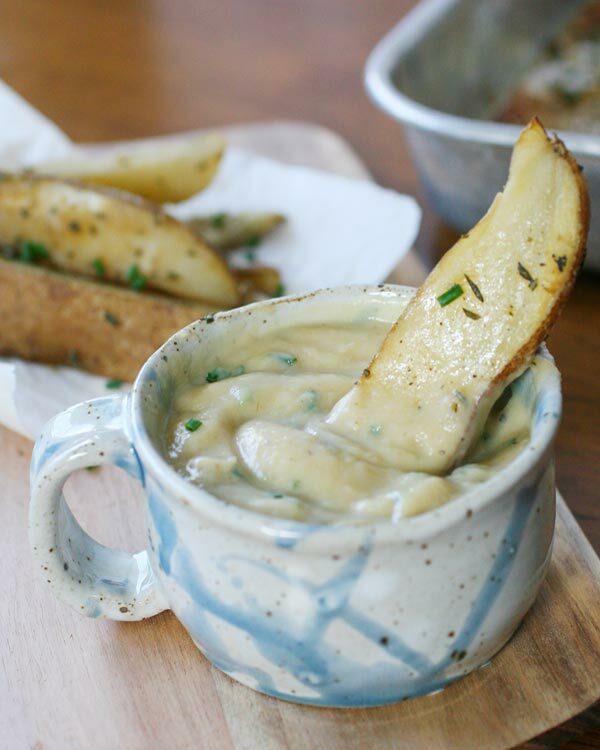 A thick sour cream perfect to dip roasted potatoes into. A note about this cauliflower cream: it is not white in color- it’s more of a creamy tan. If you want to have a whiter sour cream you can try using steamed cauliflower rather than roasted. This will make the cream less solid because steamed cauliflower will retain more water than the roasted cauliflower will, but it might work. I do use a drop of water in the blender to process the cauliflower, so perhaps the water content from steamed won’t matter. I didn’t try it so if someone does, let me know how it goes. When I told my wife that I was making sour cream out of cauliflower, she was skeptical. She was skeptical when I talked about the onion cream. She remained skeptical as I measured lemon and salt into the blender. Even when I put a plate of roasted potatoes alongside a bowl of the cream in front of her, she was skeptical. But then she took a bite and was a skeptic no more. She loved it. This cream has the same creamy tartness that you’d expect from sour cream. You can adjust the tartness by adjusting the amount of lemon you use. I like tart more than most, so this cream reflects that. If you prefer something more creamy than tart, just reduce the amount of lemon used by half. I’m already re-imagining different sauces that I can make using this cream as a base. I’m dreaming about adding a bit of garlic powder to create a creamy pasta sauce with all the taste of a cream sauce but without the added oil. This vegan cauliflower cream was tasty on roasted potatoes, but I can imagine that it would go good on any potato- chips (as a chip dip), fried (yum), or baked (double yum). I already mentioned how I want to use it as a pasta sauce by adding some garlic powder, I’d probably add some basil and black pepper to it as well. You could also use this cream in a thick stroganoff or pot pie gravy. The possibilities are endless. This cream is gluten-free and oil-free, of course. If you make this sauce or a version of it, let me know. I’d love to hear about your creations. A silky smooth cream sauce made from 4 simple ingredients. Clean and cut cauliflower into florets. Place florets in glass baking dish with a small amount of water in the bottom of the dish. Bake in a 400 degree oven until completely soft, turning and adding water as needed. Do the same for the onions. Once the cauliflower is done, set aside and let cool completely. Place cauliflower into a high-speed blender with a couple of tablespoons of water and puree until smooth. Empty into a bowl. This will yield roughly 2 - 2 1/2 cups of pureed cauliflower. Next, gently peel the onions and add to the blender and puree until smooth. Two large onions will yield roughly 1/2 cup of onion cream. Add the onion cream to the cauliflower cream. Add lemon juice and salt. Blend until fully combined. Mild enough for use with a wide variety of flavor combinations. You can also modify the amount of lemon used in the cream based on your need or preference. It's super versatile and this recipe makes a large amount of cream, so you'll have enough to try multiple varieties. This sounds amazing. I love cauliflower cream. OMG so creamy, and no oil !! I’m not on a no-oil diet, so I guess I will just pan roast the cauliflorets in a little oil.